We have unlimited possible futures ahead of us, but understanding which one we will arrive at is actually quite simple. You simply have to look at the current value system trends and changes that society is undergoing and project them into the future with important decisions. There are currently 2 major value systems in play in the world right now. The dominate one is an artificial Scarcity-Based Value System (SBVS). 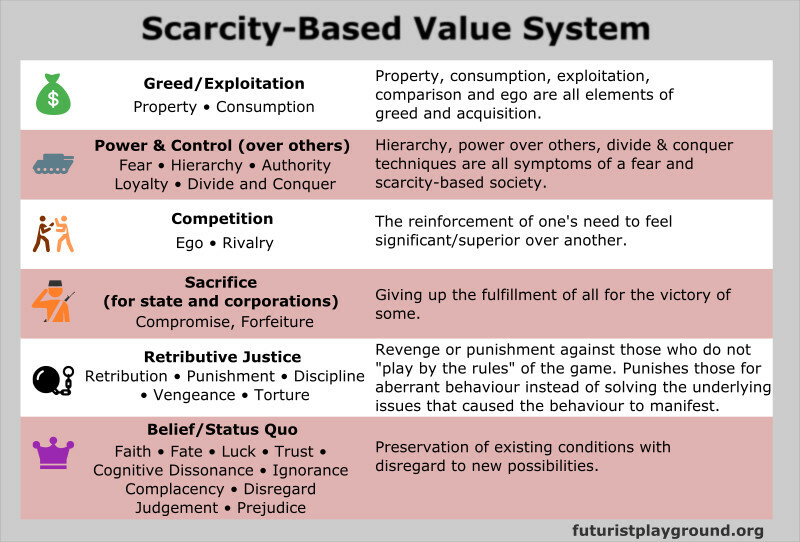 It is essentially the continuation of the true scarcity-based value system the world was operating on before the Industrial Revolution. However, in the early 1900’s advances in our technology offered us true abundance and a decision was made to maintain the status quo by adopting artificial scarcity, planned obsolescence, perceived obsolescence, and the practice of destroying resources to create scarcity. All this was done in order to maintain the current power dynamic rather than embrace a new Abundance-Based Value/Decisioning System (ABVS) that would benefit 100% of humanity. Values and decisioning can be used interchangeably because ultimately humans arrive at decisions based on their values. If humans believe we are in a time of scarcity (greed, power and control, competition, sacrifice, status quo), they will continue living that way. However, technology allows us to live in abundance in which the Abundance-Based Values are more efficient to manage society. Understanding this, we can design possible futures and see if they are compatible with the value systems. If they are, a society that uses that value system will be more likely to create a future resembling this. If they do not, then it is simply not going to happen. We create our future, it is not something that happens to us. Let us first analyze the current decisioning system in place. It may seem offensive, and in truth, you should be offended by it, but this is the reality most people are living by. It is not a value system most of us would like to admit using, especially because we don’t need to continue using it for our survival anymore. Continuing with this value system will continue to create a greater divide leaving more and more of us in poverty. If you currently work for a living, you are likely to end up in poverty in this current system within the next decade or two. To understand the technology that is going to automate your job in the very near future, watch Humans Need Not Apply for an introduction or Robots Will Steal Your Job for a more detailed list of tech. Keep in mind both of these videos are more than one year old so the tech shown has already doubled in performance from what was shown and will continue doubling according to Moore’s Law. I think we can all agree that none of us want to live in poverty, so what can we do to increase our chances of having a better future for ourselves and our families? The answer sounds surprisingly simple, but it wasn’t understood until very recently. Let us analyze the environment of abundance and then see if that environment is compatible with the given values. 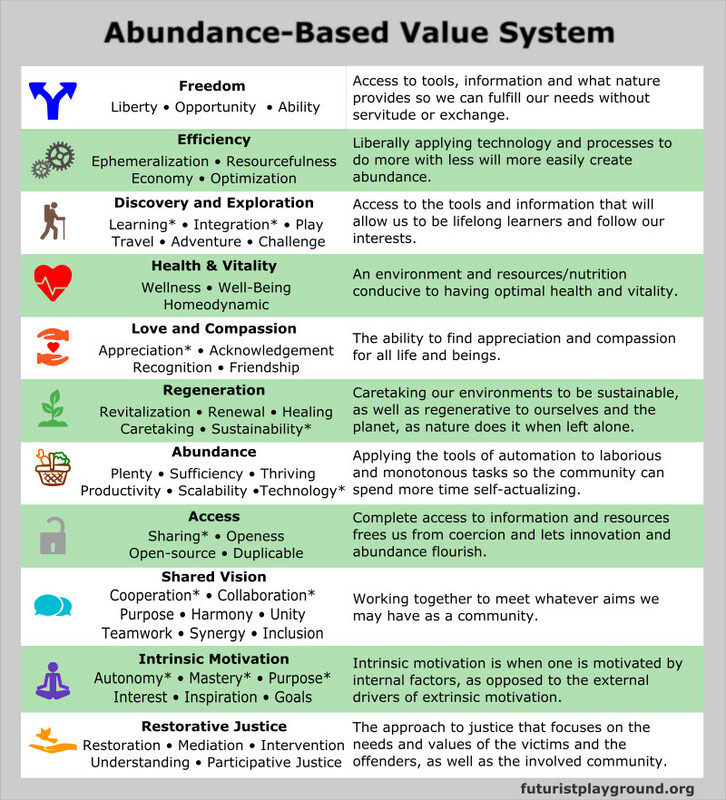 If so, by simply adopting this value system, we will collectively start building the future of abundance we all desire. If we do not adopt a new value system, what will our future look like? Well, it is already being built for us using tax dollars. Yes, the prison system in America is growing exponentially and the majority of its prisoners are people who were in desperate situations. Imagine if we all simply had the option to live in a regenerative city for free instead of being forced to try and get money, no matter the cost to ourselves or others. If food was available at the store, but no jobs were available for you, would you take the food or would you let your kids starve? Could you rationalize stealing food that would otherwise be thrown away when it doesn’t sell in order to save the lives of those you care most deeply about? What we are presenting here is simply an alternative way of living on earth. It is your choice to adopt this future or continue supporting the dystopian future, but now that you understand this, do not be surprised by the future you choose and help to create.